When we were about to be married, Mr. Shops and I visited my parents who were living near the Pennsylvania Amish country. Never one to pass up a good shop-while-traveling opportunity, our purchases included hand sewn quilts, delicious hard pretzels and colorful rag rugs. Mother-daughter duo designer Susan Serra and Kelly Serra Donovan travel much farther — to Scandinavian countries — seeking Scandinavia home décor including beautiful and original works of art for others to enjoy in their homes. 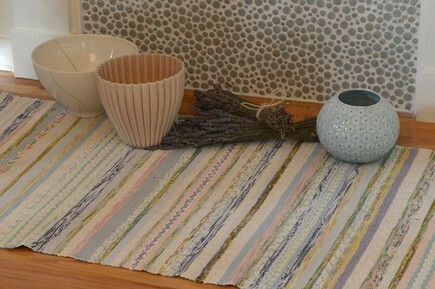 Among the select artisanal wares are handwoven rugs and distinctive ceramics. These heavy duty rugs are made by tightly weaving strips of cloth recycled from clothes, bedding, curtains and whatever else is no longer in good original shape, but too good to trash. This variety of materials gives each rug its unique personality, texture and color. Better yet, each one-of-a-kind floor covering is reversible. It’s always the perfect time to change out or add new scattered rugs, right? An organic textured vase dances with the sun. 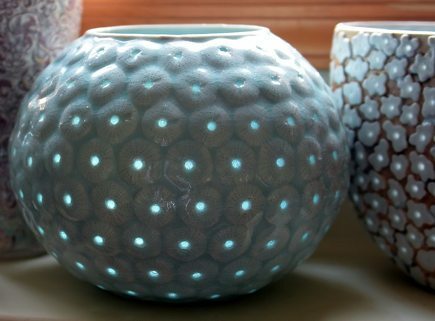 Glazed holes in the porcelain bowl turn it into a ‘light catcher’ that visually changes with the direction and intensity of light cast upon them. The website also carries other ceramic tabletop and server are, along with wall art and decorative pieces.